Specs: Summit elevation: 7770′; Base elevation: 6795′. 2 surface lifts: 1 t-bar, 1 rope tow. Terrain Mix: 30-35-35. Longest Run: 7920′. Season: usually December-March. Rentals. Annual Snowfall: 230″. Specs: Summit elevation: 7600′; Base elevation: 5800′. 7 Lifts: 2 quads, 1 triple, 4 doubles. Uphill capacity: 10,000/hr. Terrain Mix: 22-45-33. Longest Run: 7920′. Season: usually late November to early April. Night skiing on 90 acres Wed-Sun plus holidays. Rentals & Lessons. Annual Snowfall: 250″. Snowmaking: 15%. The SKInny: Surprise, this is probably the best pure skier’s ski area in Idaho. In terms of reputation and publicity it clearly plays second fiddle to Sun Valley, but Bogus has that venerable resort beat in almost every category except vertical drop and sightings of important celebrities with Hummers and 6,000 square foot climate-controlled mansions who rant about environmental sensitivity. We’ll save that for later…back to Bogus: This ski area really does have something for everyone. Beginners, intermediates, experts and extreme skiers each have their own niche at Bogus. The face of Shafer Butte offers flat-out, wide open drops for hotshots. The sprawling layout among numerous peaks is almost a mini version of Utah’s The Canyons, without having to hike back to lifts. Tree skiing provides powder, and some traversing supplies ample back country routes. At the other end of the spectrum, beginners have plenty of variety as well. Bogus Basin is seldom a touristy destination, but it should be. Or maybe not; probably better off this way. Did we mention the pricing? Very reasonable considering the variety and quality of the facilities. In a quiet, understated, underpublicized way, Bogus Basin is one of the best ski areas in the country. Signature Trails: Silver Queen (Novice), Nighthawk, Last Chance. Specs: Summit elevation: 7640′; Base elevation: 5840′. 7 Lifts: 1 quad, 4 triples, 1 platter pull, 1 paddle lift. Uphill capacity: 6700/hr. Terrain Mix: 25-50-25. Longest Run: 13,560′. Season: usually late November to early April. Rentals & Lessons. Annual Snowfall: 300″. The SKInny: Mid-sized mountain that acts a lot bigger, and first time skiers expect it to be bigger because of its reputation. Although there are bigger, more cosmopolitan ski areas in Idaho — and better ski areas — Brundage is the one a lot of people call their favorite. Lots of different fall lines, ridges, and faces; wanderers will love this place and hotshots will like everything but the lack of crowds. One of the knocks on Brundage is the fact that it is far away from what passes for cities in Idaho, which isn’t necessarily a drawback. Snowcat skiing is offered for the adventurous. Nice meandering trails for the developing skier, plenty of steeps, bowls, and glades for the expert — but the majority of terrain is blue, so Brundage really has all the bases covered. Specs: Summit elevation: 5565′; Base elevation: 4280′. 2 Lifts: 1 t-bar, 1 rope tow. Uphill capacity: 400/hr. Terrain Mix: 28-29-43. Longest Run: 4000′. Season: usually mid December to March, Fri-Sun plus holidays. Night skiing on Fridays. Rentals & Lessons. Annual Snowfall: 45″. The SKInny: Small, throwback ski area. Established in 1967 has four primary runs and a few trails. Eat your Wheaties and make sure your legs are in shape, because it’s all served by a 3,000-foot-long T-bar. Beginners enjoy a 250-foot rope tow with a 30-foot vertical drop. If you’re in the neighborhood, you don’t want to miss the opportunity to try it. Unfortunately there aren’t too many places like Cottonwood Butte remaining. Specs: Summit elevation: 6600′; Base elevation: 5600′. 6 Lifts: 4 doubles, 2 rope tows. Uphill capacity: 3400/hr. Terrain Mix: 35-45-20. Longest Run: 6900′. Season: usually December to March, 7 days. Night skiing Mon-Sat. Rentals & Lessons. Annual Snowfall: 200″. The SKInny: Operation located on National Forest land, an old favorite for Idaho Falls locals. Has the misfortune of being very close to Grand Targhee and within driving distance of Jackson Hole, two of the top ski resorts in the country. Emphasis on developing novices and intermediate skiers; the black diamonds are not overly challenging. Outstanding for groups, families, etc. but not really a destination for hotshots or wanderers. The hot drops that it does have (911, Face, Whoa Joe, etc.) are all rather too short to really set the heart a flutter, but again, this is an easy, relaxing, enjoyable type place. Only real knock is that conditions can sometimes be spotty. Otherwise, Kelly Canyon is one of those “small but mighty” places where, when the day is over, you wonder where the time went. Specs: Summit elevation: 5650′; Base elevation: 4800′. 5 Lifts: 4 doubles, 1 rope tow. Uphill capacity: 4000/hr. Terrain Mix: 20-50-30. Longest Run: 6350′. Season: usually mid November to late March, closed Tues & Weds. Rentals & Lessons. Annual Snowfall: 400″. The SKInny: Another smallish, throwback ski area on USFS land. Low prices, short or no liftlines, generally good snow. This is an area moving onward and upward; it has tripled in size in just four years, but appears to have lost none of its charm. Excellent for novice and emerging blues, with a few surprises for the expert as well. Not much vert, but if you ski it once, you’re a lifetime fan of Lookout Pass. Signature Trails: Montana Face, Idaho Face, Lucky Friday Glades. Specs: Summit elevation: 5700′; Base elevation: 5295′. 1 Lift. Terrain Mix: 35-45-20. Season: usually mid December to March. Annual Snowfall: 180″. The SKInny: Operated by the Payette Lakes Ski Club. Memberships available; promotes education, learn-to-ski programs, racing, and other events. We need more Little Ski Hills. Specs: Summit Elevation: 7240′, Base elevation: 6500′. 3 Lifts: 1 double, 2 surface. Uphill capacity: 1200/hr. Terrain Mix: 30-25-45. Longest Run: 5200′. Season: usually early December to March, Rentals & Lessons. Annual Snowfall: 230″. The SKInny: Little local spot that offers big mountain quality on a smaller vertical. Under new ownership (well, relatively new I guess) and this place now has quite a bit going on. In addition to downhill, Magic provides XC trails, snowshoe trails, rentals on all this stuff. Great community here. Specs: Summit elevation: 8500′; Base elevation: 6300′. 3 Lifts: 2 triples, 1 double. Uphill capacity: 3600/hr. Terrain Mix: 12-35-53. Longest Run: 6000′. Season: usually mid-December to April. Night skiing Fri-Sun. Rentals & Lessons. Annual Snowfall: 250″. Snowmaking: 15%. The SKInny: Once a local hill nicknamed “The Rock” that expanded in 2001, and now has a serious vertical. Qualifies on the small side of “big” ski areas…the 2200′ is legit. Not your ideal conditions when snow is scarce; very little snowmaking to fluff things out. Note also the very high percentage of “expert” terrain. This is legit — there are some challenging trails here — but they do not overlook the beginner and novice; ski school programs are excellent for all abilities. A great, underrated ski area. Comfortable, laid-back atmosphere, yet plenty of opportunity for off-piste adventures; another 700′ of hiker vertical opens up some serious glades for the extreme skier. Novice terrain is separated from the main lifts, intermediates lay claim to the lower bowls, and experts own the canyon area. Good layout. Specs: Summit elevation: 9000′; Base elevation: 8000′. 3 Lifts: 1 triple, 1 double, 1 rope tow. Uphill capacity: 3100/hr. Terrain Mix: 35-40-25. Longest Run: 8000′. Season: usually late November to early April. Night skiing Tue-Sat. Rentals & Lessons. Annual Snowfall: 500″. The SKInny: Small by western standards, Pomerelle is a terrific mid-sized ski area. Family owned and operated, family-oriented, but definitely a young crowd. 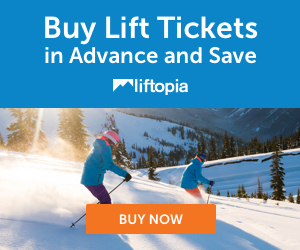 Liftlines are short, prices are reasonable. Excellent for beginners, and intermediates will be challenged enough to improve. Experts can take it easy for a day, but pedal-to-the-metal hotshots will want to head elsewhere. An all-around fun ski area. Good all-around mix of trails, chutes, glades, and open bowl type skiing. Great scenery. Specs: Summit elevation: 5895′; Base elevation: 5400′. Pomalift. Terrain Mix: 20-60-20. Longest Run: 8000′. Season: usually late December to early April. Open Saturdays & Sundays; night skiing on Friday nights. Lessons. Snowtubing. Annual Snowfall: 100″. Specs: Summit elevation: 6400′; Base elevation: 4000′. 8 Lifts: 1 sixpack, 1 quad, 1 triple, 3 doubles, 2 handle tows. Uphill capacity: 9800/hr. Terrain Mix: 20-40-40. Longest Run: 8000′. Season: usually late November to early April. Night skiing Fri-Sat. Rentals & Lessons. Annual Snowfall: 300″. The SKInny: Schweitzer is a bigtime ski area; number one in the panhandle and second biggest in Idaho. Trying to become a Sun Valley/Park City/Telluride destination, but not quite there yet. Liftlines can be dreadful; some equipment has been updated but it seems like Schweitzer is the gawky teenager that isn’t quite comfortable growing into adulthood. Locals do quite well here, they know their way around and avoid the liftlines. And Schweitzer does indeed have something for everyone; bowls, chutes, glades…and plenty of powder. A good layout; a smaller separate chair for novices, plenty of terrain for intermediates, and seemingly never ending options for the expert. Mid-stations on two of the lifts give intermediates and emerging experts an opportunity to bail out below the toughest terrain. Nice, big ski area, needs to grow into its phenomenal potential. Signature Trail: White Lightning, Stiles. Specs: Summit elevation: 6300′; Base elevation: 4100′. 6 Lifts: 1 gondie, 2 triples, 2 doubles, 1 surface. Uphill capacity: 7700/hr. Terrain Mix: 20-40-30-10. Season: usually late November to mid April. Night skiing fri & sat. Rentals & Lessons. Annual Snowfall: 300″. Snowmaking: 15%. The SKInny: It’s hard to find something negative about Silver Mountain; the only real drawback is that you probably live nowhere near it. On the other hand, if you live within striking distance, you already know that this is easily the best kept ski secret in Idaho and possibly the entire western hemisphere. If not, you just have to convince the family somehow that Kellogg Idaho — not Vail, not Tahoe, not Cottonwood Canyon — is the place you ought to head for your next ski trip. Try it, and you’ll see why it’s such a well kept secret. All-around fantastic skiing, terrific powder, virtually no liftlines, reasonable pricing. Layout is kind of quirky; almost like an upside-down mountain due to gondola ride to lodge…interesting place. Emphasis on expert skiing but all abilities have plenty of terrain. Experts will find a ton of glades, with new routes added for the 2007-08 season. One of the country’s great underrated ski areas. Signature Trails: The Ridge, Sunset, Centennial. Specs: Summit elevation: 5600′; Base elevation: 5200′. 2 Lifts: 1 t-bar, 1 rope tow. Uphill capacity: 700/hr. Terrain Mix: 75-25-0. Longest Run: 2500′. Season: usually December to March; Sat, Sun & holidays. Night skiing. Rentals & Lessons. Annual Snowfall: 130″. The SKInny: Last time we checked, the highest priced ticket was $17. This is a laid back, family-oriented, unintimidating hill for beginners and developing intermediates. It will never be confused with a bigtime ski resort, but then again, you don’t always need a big ski resort. I do know that America needs more Snowhavens. If you are in the Grangeville area, stop in, make a few runs. Places like this need our support, and we sure don’t want to see them disappear. And if you are teaching someone to ski, you’re a lot better off at Snowhaven. It’s run by the City of Grangeville, which gets serious kudos for keeping this place going. So many towns cut budgets on operations like this, then wonder why drug abuse increases among young people, why the school recreation budget goes skyrocketing, etc. You’ll find some awesome XC options nearby. Specs: Summit elevation: 7150′; Base elevation: 5740′. 4 Lifts: 2 doubles, 1 handle tow, 1 rope tow. Snowcat skiing. Uphill capacity: 2500/hr. Terrain Mix: 20-40-40. Longest Run: 9000′. Season: usually late November to early April. Rentals & Lessons. Annual Snowfall: 200″. The SKInny: This is a mini Sun Valley — similar terrain — without the pricey trappings. Tickets are cheap, lines are short. Once owned by Bruce Willis and Demi Moore; unsure of current ownership. Regardless, it is a fantastic mid-sized ski area. Powder, peace and quiet. Hard to find a better ski area. Signature Trails: Snow King, Soldier Chute. Specs: Summit elevation: 9150′; Base elevation: 5750′. 19 Lifts: 7 quads, 4 triples, 5 doubles, 2 surface, 1 carpet. Uphill capacity: 26,780/hr. Terrain Mix: 36-42-22. Longest Run: 15,840′. Season: usually late November to mid April. Rentals & Lessons. Annual Snowfall: 220″. Snowmaking: 31%. The SKInny: Venerable old Sun Valley, great skiing, great scenery, home to the stars. Unfortunately, most skiers can’t afford a steady diet of Ketchum. Sun Valley really does target the rich and famous. If you do not fit in one of these two categories, you may not enjoy Sun Valley as much as you might enjoy another resort. It has plenty of what we’ll call “attitude.” It is, after all, Sun Valley. You do not want to show up here sporting rear entry boots unless you can run the zipper down Exhibition. Enough said. Sun Valley is two mountains: Dollar Mountain, a rolling, sun-drenched utopia for beginners and novices. It is groomed like the 18th green at Augusta. Everyone skis well on Dollar Mountain. The big boy, Baldy, is an intermediate-expert hill. The lift layout is a little frustrating, but the lines are usually short and the skiing is fabulous. Even on holidays you’ll move up the hill fairly quickly. Mostly bowl skiing, usually powder, always fantastic. Sun Valley is one of the best ski areas in the country, and you have to pay for it. A few of the trails are flat out tough; low level black diamond skiers need not apply. But hey, this is the playground of the rich and famous, and Sun Valley caters to them with an abundance of meticulously groomed cruisers. Sun Valley is big, it’s pricey, it glimmers and glows…it can be a bit overwhelming for the average skier on an average budget. Specs: Summit elevation: 7700′; Base elevation: 4900′. 7 Lifts: 3 detachable quads, 2 fixed grip, 1 platter, 1 carpet. Uphill capacity: 7,000/hr. Terrain Mix: 17-44-39. Longest Run: undetermined. Season: usually late November to mid April. Rentals & Lessons. Annual Snowfall: 300″. Snowmaking: 10%. The SKInny: Tamarack is the latest and greatest, newest and mostest for Western Idaho. Brundage was previously the big game in town; many locals still favor it but Tamarack is definitely up and coming. Not sure what the long term ski scene will be as Tamarack claims to limit ticket sales to 2,000 per day. Be interesting to see how this plays out. The focus is squarely on real estate development, golf, clubhouse, condos, blah blah blah. It just so happens that this is one heck of a ski mountain, in an area that is poised to have explosive growth. UPDATE: Unfortunately things have been in a stop/start situation here, operating losses in the millions, defaulted loans in the multi-millions…add it all up, and you’ve got a brand-spanking new resort that closed when the housing boom dropped. But a group of plucky homeowners and interested townspeople got the place running again in a bootstrap operation…and then it was all going to the auction block, but now another homeowners group or somebody stepped in at the eleventh hour, not sure what to expect at this point.